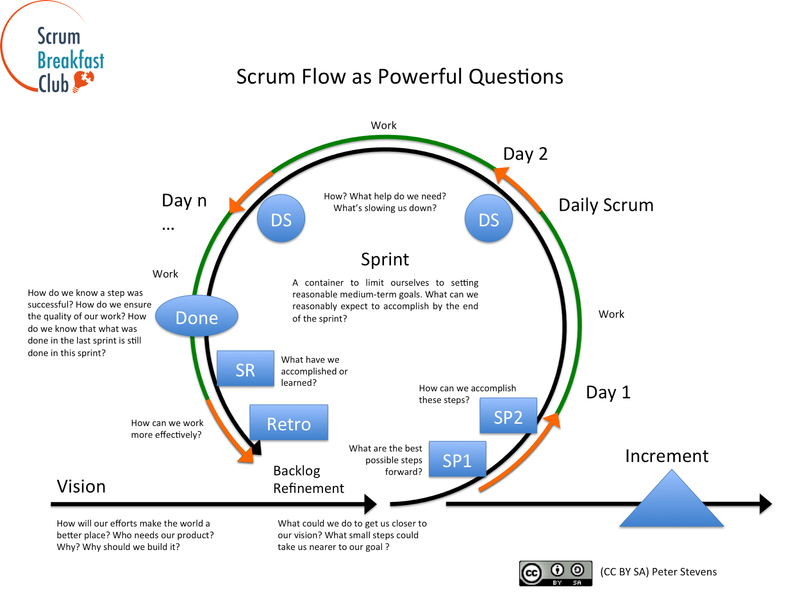 What powerful questions does Scrum help you answer? The video on powerful questions made me think about the deeper purpose of the various Scrum activities. Can I formulate Scrum as a series of Powerful Questions to be general enough, that they might be useful outside of software development? Here is the image I came up with and below are the questions I think each of the Scrum Activities and artefacts strives to help you answer. The Sprint is a container to limit ourselves to setting reasonable medium-term goals. What can we reasonably expect to accomplish by the end of the sprint? How will our efforts make the world a better place? Who needs our product and why? Why should we build it? What characteristics should our product have? What goals must we accomplish to achieve our vision? What could we do to get us closer to our vision? What small steps could take us nearer to our goal? How can we make the steps smaller and more likely of success? Part 1 - What is the best possible step forward, given what we know today? Part 2 - How can we accomplish these steps? How will we accomplish them? Who needs to talk about what? What could be slowing us down? What have we accomplished or learned? How does this change our vision? How do we know a step was successful? How do we ensure the quality of our work? How do we know that what was done in the last sprint is still done in this sprint? Is your Scrum User Group really a user group?